This planer does all that I ask it and more. Boards come out with smoothness and just a touch of love. Uploaded this pic form somewhere. Really looks like my garage??? Nah, too neat. I have one. Works well. On my list, too. And the jointer/planer. I’ve had a lot of success with mine as well, but, I’m less than thrilled with the dust/chip collection chute. I seem to have alot of waste shooting out through the entrance end. -- Skip from Batavia, purveyor of fine and exotic sawdust & chips. Tiger – Which Ridgid planer are you reviewing? The one in the pic doesn’t look like the current model that Verna shows (R4330). knottscott, this is the older planer that steel city reclaimed from china and added a spiral cutter head. This is the original Ridgid. The orange one in stores now is what i think a better planer 3blades vs. 2 like mine. BTW, I purchased the spiral cutter head from steel city about a year ago. i don’t have the stones to take it apart and put it back together. I am Another happy Ridgid planer customer!! I bought mine from Home Depot in January for $399 + tax. 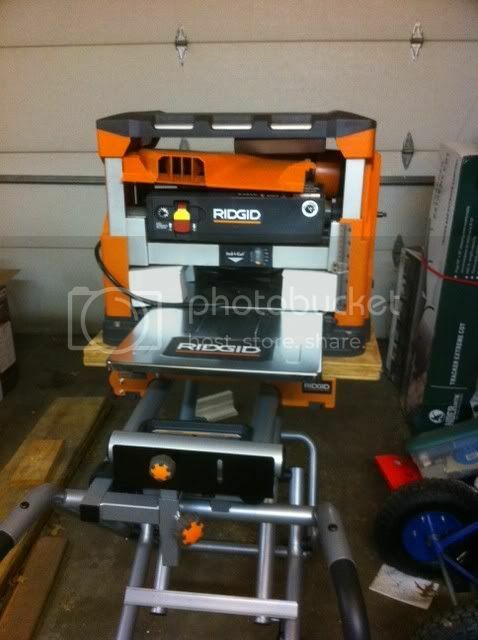 $189 + tax for the Ridgid gravity miter saw stand. I bought mine used at an estate sale. 200 beans. $399 is a darn good buy for the new updated model. I have an older model with the 2 blade cutter, have had it for years and really like it. I have some snipe but not horrible and it doesn’t always happen. I probably haven’t run a huge amount of material through it; I’m still on the same set of blades but I have reversed them.